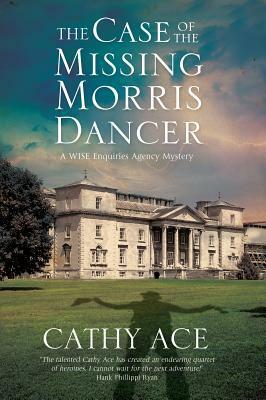 The Case of the Missing Morris Dancer – Guest Post and Giveaway! When Henry, a Welsh Duke, decides to be married, there are a myriad of traditions that he is expected to uphold. One such tradition involves Morris Dancers leading the happy couple through town from the church back to the family’s estate. After one of the dancers vanishes, the WISE Enquiry Agency is hired to look into the matter. I really enjoyed the team of women doing the investigating in this story. Their distinct personalities work well together, as each has her own strengths to bring to the group. That and the Welsh countryside as the setting made this a very enjoyable read for me. I had never heard of Morris Dancing before reading this book, so it’s a true pleasure to have the author here to explain it to us. Thanks for having me along today – and for giving me the chance to talk about my forthcoming book THE CASE OF THE MISSING MORRIS DANCER. Maybe some folks aren’t familiar with what “Morris Dancing” is…so I’m going to take the chance to shed some light on this ancient form of folk-dance that’s pretty specific to Britain, and was particularly popular during Tudor times. It’s currently enjoying something of a revival of interest. Morris Dancing, or The Morris, is a form of folk dancing that’s traditionally done by men, though now some Morris troupes (or sides, as they are also called) are inviting women to join, and there are few all-female Morris troupes in various parts of the UK. Its origins are lost: some say that the word “Morris” is a bastardization of “Moorish” and that the tradition began when dark-skinned immigrants danced in the streets of Britain back in the twelfth century. Others say that the black-face tradition in many Morris troupes is merely a result of the mischief-making element of the dances, with the painted face of the miscreant providing an effective disguise. Certainly there are many connections with traditional fertility beliefs, and some troupes have never had a black-faced dancer, but rather a green-faced one – representing the Green Man. There are also other “characters” in Morris dancing: The Maid, or Marian, is a man dressed as a woman who might refer to Robin Hood’s companion; the horse is a crudely fashioned horse’s head on a stick that’s “ridden” like a hobby-horse by one of the dancers, or else is a frame with a horse’ head that sits around the dancer’s waist, like a skirt. Certainly there’s music – maybe a squeeze-box, or other instruments that allow folk tunes to be played, and often drums or some sort of percussion; then there are the handkerchiefs (or cloths) and sticks (or batons) used by some troupes. The cloths were often woven from local wool, and the batons cut from local copses…the cloths are waved, the batons are smacked together. Usually the dancers also wear little round bells on straps tied around their legs just below their knees, or on their arms, giving each motion of their limbs, and especially their stamping and jumping (of which there’s a great deal)a constant accompaniment of jingling. Highly decorated hats are not uncommon, and the sometimes the white shirt and trousers the men wear are set-off with vivid elasticated braces over their shoulders, crossing on their backs, or maybe they’ll wear highly decorated waistcoats. You’ll see Morris Dancing mainly across England and Wales during the summer months, though each geographic region has its own highly distinctive versions of the dance. Check it out online – you’ll be able to see some fun videos. I appreciate the detailed review and author feedback. Thanks. This is a new author to me, but I enjoyed reading the synopsis of the book and can’t wait to read. The book sounds fascinating! And thank you for the explanation of Morris dancing. I’ve seen it in episodes of Midsomer Murders and never caught it if they did say what type of dancing it was.